Hold on to your hats: one of the UK’s biggest and boldest theatre/circus spectaculars, Cirque Berserk!, will be returning to the West End for a limited two-week engagement at London’s Peacock Theatre next February. Combining beautiful contemporary circus artistry with hair-raising, death-defying stunts, all designed specially for staging in a proscenium arch theatre, Cirque Berserk! is set to enthral thrill-seeking audiences in London’s Theatreland once more. Next year’s Cirque Berserk! 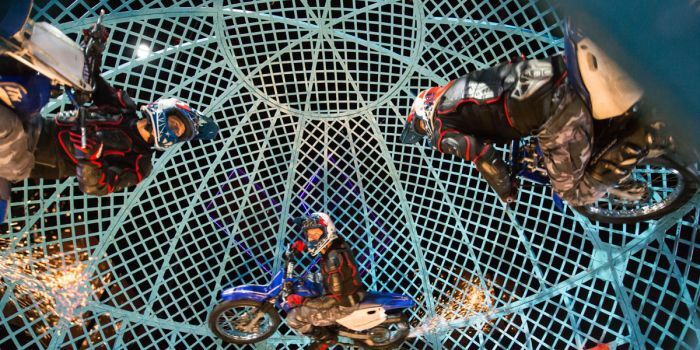 will see the return of its most famous – and most dangerous – act, the legendary ‘Globe of Death’, in which four motorcyclists defy gravity and risk life and limb traversing the inside of a spherical steel cage at speeds of up to 60 miles per hour, putting their split-second reactions to the ultimate test. They will be joined by a magnificent company of over 30 jugglers, acrobats, aerialists, dancers, drummers and daredevil stuntmen from all corners of the globe in a jaw-dropping display of talent after talent. Cirque Berserk! will play at the Peacock Theatre from 5 February to 17 February 2018, prior to embarking on a 40-week UK tour. Official London Theatre previously described the show as “circus extravaganza easy to watch, even easier to enjoy, and impossible to tear your eyes from”. You can book your tickets through the Peacock Theatre website.